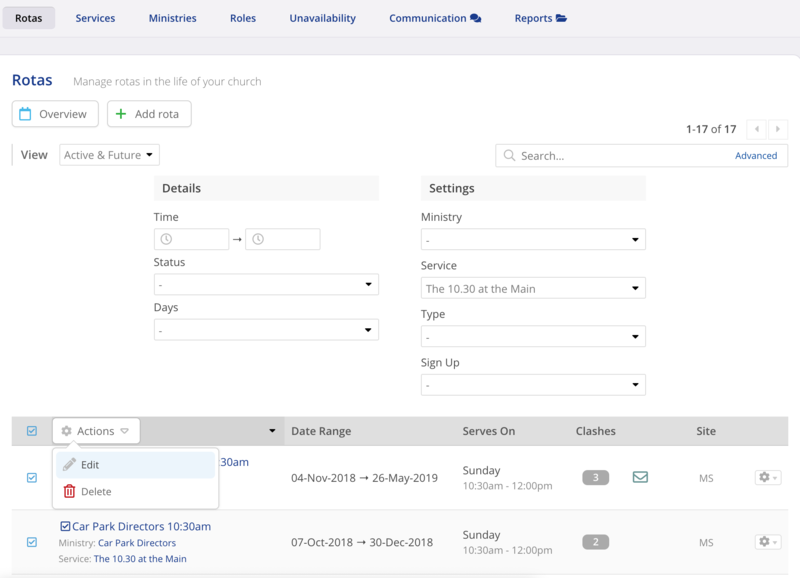 You can group rotas into your church's various Services for the purposes of reporting and communication. Rotas within the same Service can also share service notes, with a service note being visible on all rotas for that service. 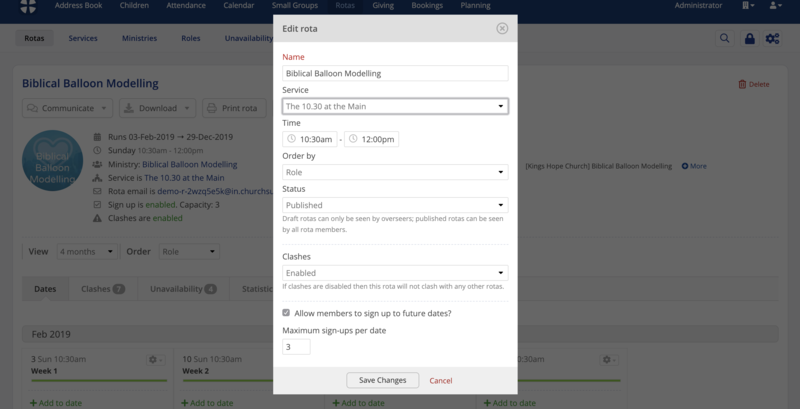 Services (and service notes) can only be created from within ChurchSuite by a user (although a rota overseer can link their rota in My ChurchSuite to an existing service that has been created). Are you a multi-site church? You should create separate services for each of your sites - in this way you can group together just the rotas for each service for each site. A rota can only be assigned to one service - it's not possible to assign a rota to multiple services. 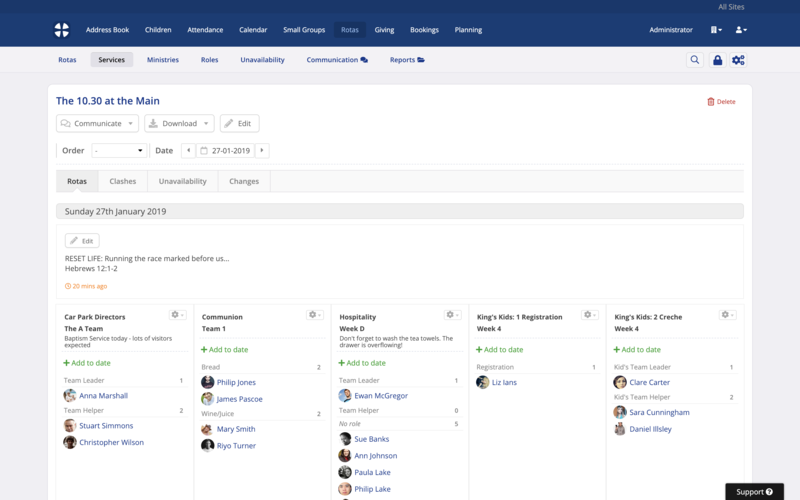 Therefore, if you are currently using roles to distinguish your various services in a rota, you'll need to break that rota into separate rotas - one rota for each site. Remember, where the same pool of ministry members serve across multiple services, you can create multiple rotas from the same ministry, one for each service - rota members will always be able to swap across rotas created from the same ministry. Additionally, since a ministry is site-specific, each site will have its own ministries, from which the site's rotas are produced. A site's rotas can then be grouped together by assigning them to one of the site's services, as explained in this article. To add a new service, navigate to Rotas > Services and click Add service. Give your new service a suitable Name e.g. "10.30am Morning Service". You may wish to include the site name in the service name e.g. 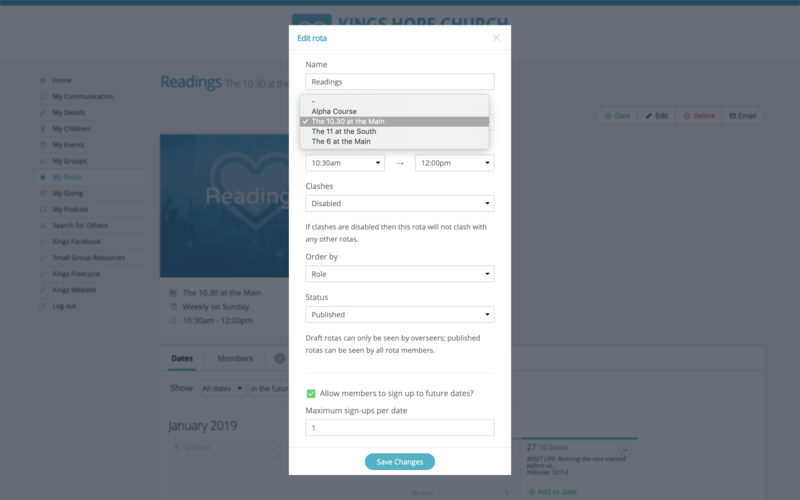 "9.30am Family Service (South Site)" - this will be helpful to rota members when viewing their rota reminders or lists of rotas in My ChurchSuite. If you have existing rotas that are not currently linked to a service, you can select rotas from the list to be assigned to the service. Click the Add service button on the pop-up window to save the new service. The new Service is created - see below. You can now add service notes to service dates if you wish - see related support article. You can also assign other rotas to the new service (see next section). 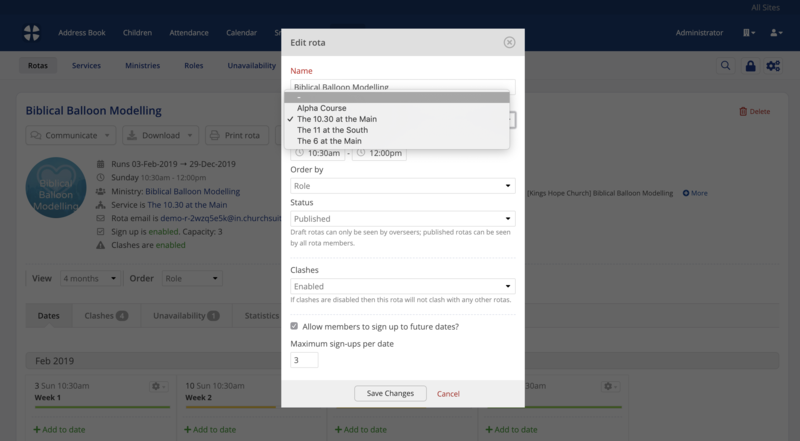 You can easily assign a rota to a Service when adding a new rota in ChurchSuite. ...and assign that rota to a Service. Note that a list of rotas to be updated are listed within the modal. Scroll down the list of rotas, checking that they are the correct ones to be updated, and type I CONFIRM in the confirmation box and then click Edit to process the changes. Be sure to wait for the batch action processing to complete - a success message is displayed confirming when the updates are finished. Returning to the Services section, notice that the list of services includes details of the Date Range of the rotas for that service and the day(s) and times that the rotas for that service Serves On. Click to View a service and the rotas assigned to that service. Overseers can also select to Edit an existing rota in My ChurchSuite and assign that rota to a Service. Note also how the list of rotas in My Rotas and Next Serving shows the service name too. In this way, the rota name doesn't need to include the service name/time in your rota-naming convention, if you wish. NOTE that new Services and Service notes cannot be added or edited by overseers in My ChurchSuite - creating new services and adding service notes can only be done by a user with "manage" permissions or an Administrator in the Rotas module in ChurchSuite. 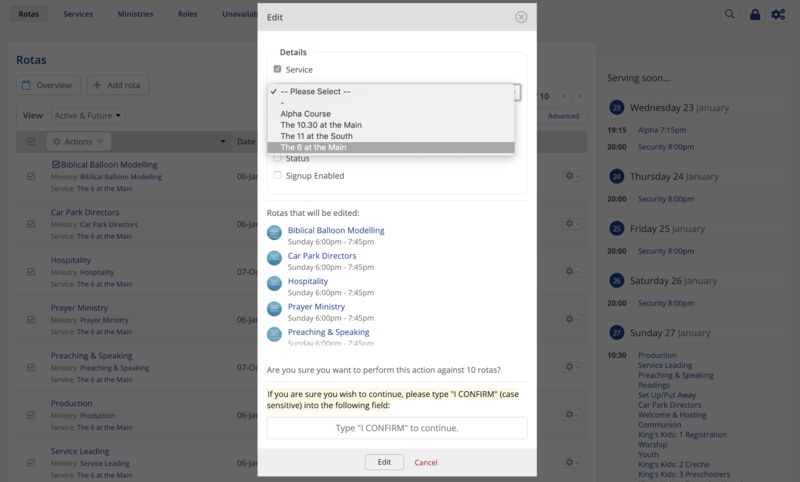 Navigating to the Services section in the Rotas module and selecting a service from the list will open that service in service view. Within the service view, use the Date selector tools to move forwards and backwards through rota dates for a service, or use the date selector to jump to a specific date. 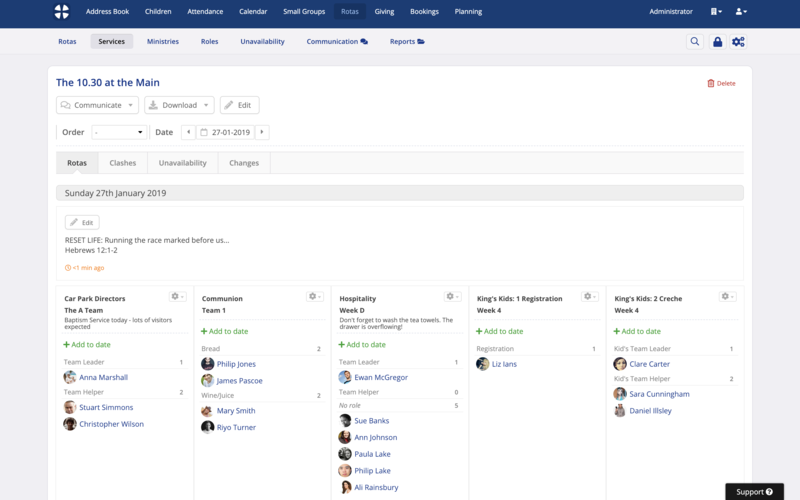 The service view respects the rota order of each of the underlying rotas, however you can override this and change the Order to Name or Role order for all rotas in the current service view. The Add dates button (shown below) is visible on any service date being viewed where there are active rotas that don't have that instance of a service date. 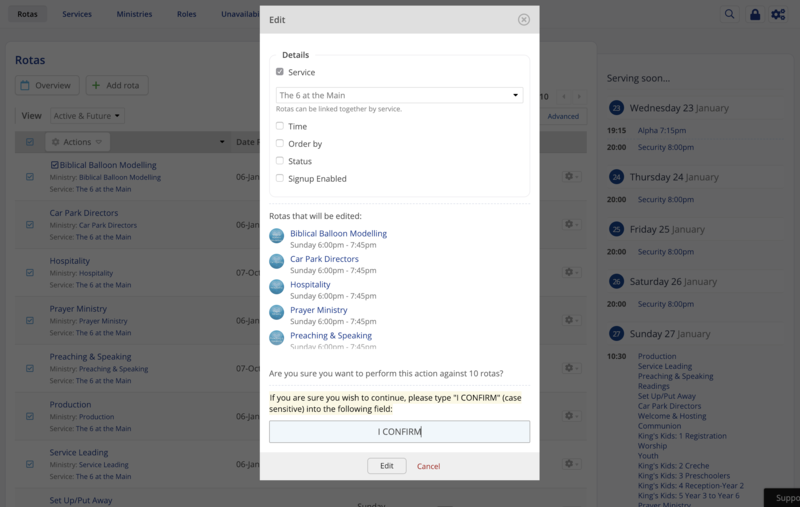 This may be intentional - for example, the Communion rota that only serves on the first Sunday of a month won't be visible on service view for the other Sundays of the month. 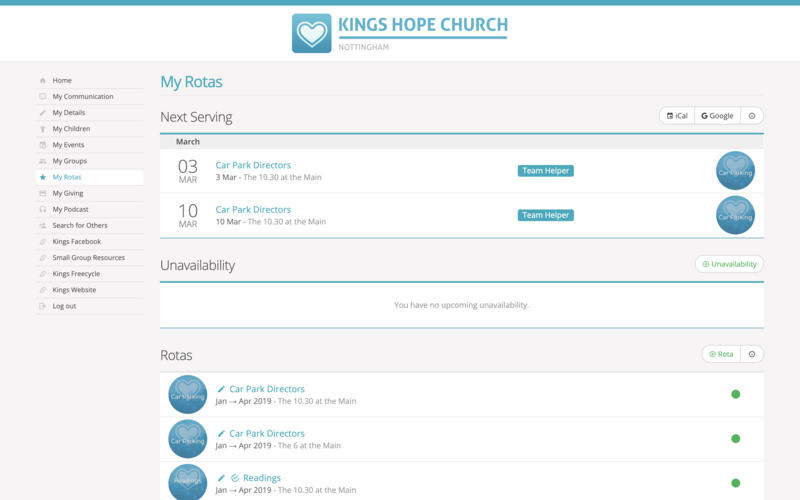 With the Add dates button, you can quickly add missing service dates to some or all of your existing rotas if you wish - perhaps where you're adding a new service date and that date doesn't yet exist on any of the current rotas for that service - for example, adding an ad hoc Good Friday service date to your existing Sunday service rotas. In the example below, clicking Add dates we see that there are no rotas that do not have a rota date instance for 28th January. Rather than adding the 28th January to each rota manually, we can easily select one or more rotas from the list to Add a 28th January date instance to. Tick the rotas in the list as appropriate and click Add to save the changes and add that date to all the select rotas. 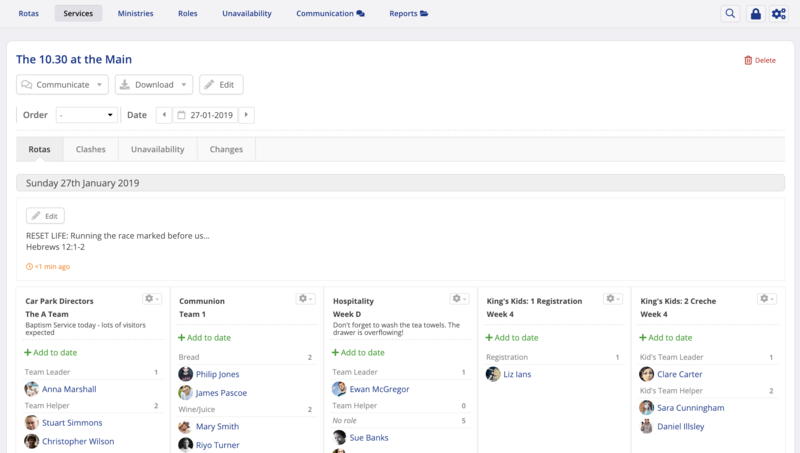 It's then really easy to add people to those rotas for that new date from within the service view - you don't have to assign rota members to each underlying rota! 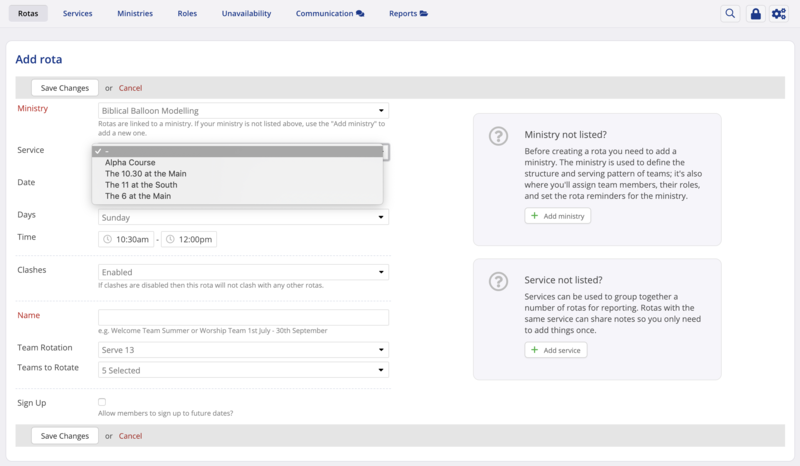 As with rota view, the service view includes full details of rota Clashes and Unavailability in respect of the service being viewed, and also a full Changes log in respect of the service rotas being viewed. Finally, you can easily communicate with all rota members for a service date using the options on the Communicate button at the top of a service view. 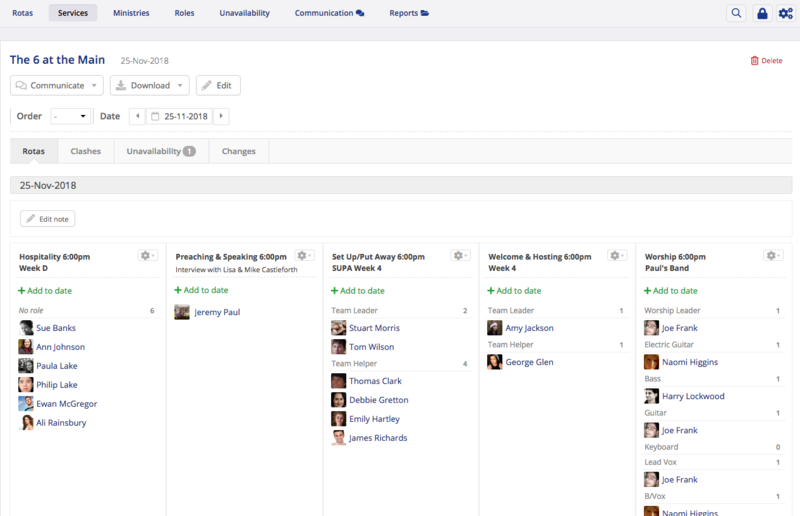 Send communications are logged against each rota member's person profile in the Address Book or Children module, and in the Recent Activity section for the service date. If you need to change the name of an existing service, select Edit while viewing any service date, or select Edit from the action cog on the Services list (see below). ...and change the Service accordingly. To delete a service entirely, either click the Delete button in the top right corner of any date within the service view, or select Delete from the action cog on the Services list (see below). Deleting a service will also delete all service notes for that service and all service rotas will be unassigned from that service. The rotas themselves are not deleted.